The Empress shows us how deeply we are embedded to our femininity. Femininity could be associated with fertility, expression, creativity and nurturing among many other aspects. It therefore calls you to connect with beauty and bring happiness to your life. Understand yourself and get in touch with your sensuality so that you can attract life circumstances to bring happiness and joy. She is a signal that be kind to yourself, to take care of yourself. The Empress is associated with fertility, expression, creativity and nurturing among many other aspects. The Empress is also a strong indication of pregnancy and motherhood. You can look for other cards to confirm if this is truly pregnancy, or rather just an indication of a motherly, nurturing and caring attitude. 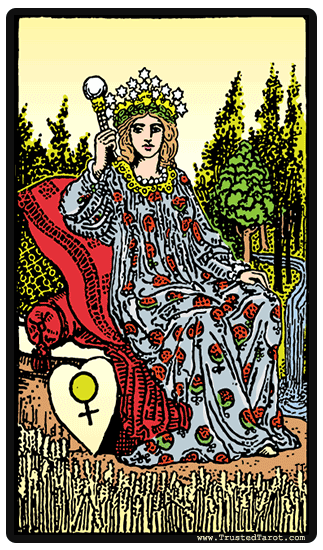 The Empress card could also mean the birth of a new idea, business or project on your life. Owing to the good fortune that surrounds this card, you can be sure that such situations and projects would end successfully in your life. Discover and bring forth those ideas that have been clinging to you and make sure that you devote yourself towards accomplishing them. This card is a sign that they are going to be successful, and well taken care of. The Empress, as the archetype of the mother earth, also encourages you to spend time interacting with nature, the mother of all of us. The Empress reversed indicates that you have lost too much of your own willpower and strength because you have started placing too much effort and concern to other people s affairs. While the Empress's nature is of showering her loved ones with attention and care, this can sometimes go overboard. You might be neglecting your own needs, or even smothering the ones you love with your well-intentioned actions. In a role reversal, perhaps a reversed Empress is finding her way into your life; it could also mean that you are relying on others to take care of you, and make decisions for you. You need to work towards removing this influence on your life, and build confidence in your own actions. Always try as much as you can to ensure that you solve matters on your own.